It is good that we have a flexible schedule. When things come up, we can usually be counted on to help. We have an overnight guest. It is her first time spending the night here. My niece can be wild. I had already promised to have a nephew overnight this weekend. Whether it would be Friday or Saturday night had never been determined. The answering machine revealed that it would probably be Friday. Aunt Sarah loves being an aunt. She is a wee bit unsure about having back-to-back overnight duty. She will survive. She will get back to the computer later this weekend. As you probably guessed, chocolate and iced coffee were not the ones to give me the answers I needed to finish the Shetland Triangle. I used my little digital scale, and when all was said and done, I had four grams to spare. I was so pleased. I wanted to use up as much of the yarn as possible, for it is very special yarn. I knit this using the Noro Kureyon Sock yarn that I won from Joan. This was also my inspiration for adding beads to the shawl. Now I cannot decide if this shawl is for me, or if it will be a gift. I love this shawl! Happy Fall! I did quite well with my summer knitting goals. I still feel like I had a miss on knitting with handspun because I did not finish anything with it. I tried my two-ply Corriedale out with a pattern, but it was not a match. I have a couple of other ideas with that yarn, so all is definitely not lost. I have an attraction/repulsion thing with Feedjit, but finally caved and added it. We will see how long it lasts. I had to do something different. Blogger annoyed the stew out of me last week eating posts and mangling them. I have yet to get a good picture of the finished Noro Shetland Triangle, so today you get to see the back of the unblocked shawl with a fabulous, feline photography assistant. I fully expected to be finished with the first Shetland Triangle by now, but obviously, have not. I am on the eighth or ninth repeat of the body chart. My progress is sure to be slower as I work to keep a better balance in my life. I have been getting a bit more work done around the house, done more strength training, and it is time to change bobbins on the Mountain Colors fiber. Unfortunately, my super-special-socially awkward self has also been putting in more time, and that puts me off my game in a serious way. I am recovering from the blunders, and even finding humor in them. At least my awareness of the increasing frequency of the episodes had me on guard, and I kept my mouth shut rather than letting loose with a rant or three. Coming back from those would have been much more difficult. Anyway, back to the Shetland Triangle. We have been trying to determine how many repeats we will work of the main chart. I want as large of a shawl as I can knit from this single ball of yarn, so I will work until I think I have just enough for one more repeat and the last chart, put in a lifeline, and hope for the best. I am OK with ripping back if I make an incorrect guess. I wish I had better advice to offer those who are new to lace and are feeling a bit of anxiety over the process. I am thinking math might help. Then again, I felt better after an iced coffee and a bit of chocolate, so that may be a better idea. The Skanky Shetland Triangle KAL has begun. I have been so ready to cast on for probably the last ten days, but I waited for the pre-determined start. However, I did not wait until sitting down with everyone tonight to begin. This is going to be such fun! I am excited for the people who are new to lace, charts, and shawls. I am so glad that they decided to take the plunge, because I know that they can do it. As varied as the people knitting along, so are the yarns we have chosen. So far, I believe there will be Schaeffer Anne, Malabrigo lace, Knit Picks Palette, a lace yarn that someone dyed himself, a camel/wool blend, and Noro sock yarn. Those last two are mine. I decided to start with the smaller version. I am interested to see how the Noro sock yarn will look with this pattern. If it does not work, I have plenty of other options in the stash. 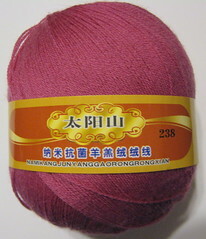 I am already excited to begin the second shawl. It will be out the of camel/wool yarn. I started my Saturday by making it out to Little Barn. I knit the rest of a ball of yarn on one project, and did not have any more of it with me. I was glad to have another project to work on, and by the time I reached a part requiring more attention, it was time to go. In between the knitting, I looked around the shop. I admired the wheels and beautiful work of two other ladies. I saw an antique spinning wheel. It is tiny and gorgeous. 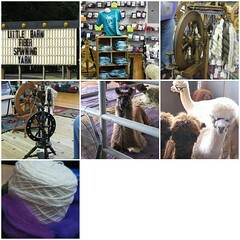 I wandered the store with a fellow knitter in search of alpaca yarn for a scarf, and fiber and drop spindles for a demonstration next Saturday (argh--I do not think I will be able to attend that event). Then I made it home. I needed a nap, but it was not to be. Before long, we were out the door and headed towards the next adventure. My mom and I made it out to see a bit of a llama and alpaca show. It was too hot for us to stay very long, but we wandered amongst the critters and spoke to a few people spinning and selling fiber. I did not bring any home, let alone the too cute baby alpacas that were for sale. I received a handout for some shindig at a local alpaca farm next Saturday (not likely to be there, either) that sounds like fun. I met a Raveler who has angora rabbits at home. I finished my day by spinning some Mountain Colors Targhee top. The scent of all of the fiber-bearing critters lingers in my nose. I fell off my ten minute spinning wagon with the Ravelympics, but I think a Saturday adventure was just what I needed to get me back on track. I finally made it out to Little Barn. It is fiber-ific! I had promised myself that if I ever ventured out there, I would buy a bag of silk top, and I did. I also picked up this blue because it is fabulous. Such a brilliant color often intimidates me, and I feel unworthy to claim it. I rounded out my purchases for the day with a bag of what is perhaps my favorite sheep name--California Variegated Mutant. It makes me smile, and it causes other people to crinkle up their faces in confusion when I speak of it. Anyway, I forgot to take any pictures when I was there. Next time, right? There are people knitting and spinning each Saturday that they are open, and now that I know my way there, I hope to attend more often. There is to be a big shindig October 4th for Spinning and Weaving Week. It sounds like it will be fun. My knitting progress for the weekend was next to non-existent. I picked my sister's top back up, and was knitting away on it at Little Barn. After knitting a few rounds, I had a problem. I had made a mistake on one lace repeat two rounds previous. I tried to fix it while I was there, but it was a no-go. The next time I picked up the knitting I was able to make things right again, but then my knitting time was over as quickly as it had begun. Camel will have its day. Now I just must wait until the fifteenth to begin knitting with everyone. I have a bit of the crud. Getting sleep would probably help. I will fill you in on the weekend adventures later. Right now it is time to jam a teapot up my nose. Hope your weekend was peachy! 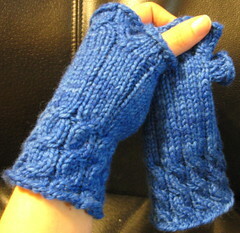 I have been on a roll with the knitting of gifts. Check out these fabulous Fetching. That birthday is not until September 15th. Since I am busily gift-knitting so far into the future, why not begin thinking about Christmas, right? So, I ask the son about the girlfriend. We have not had much opportunity to get to know the young lady, but they have been a couple long enough that I decided to ask if she is the kind who would like a knitted gift. I know that not everyone adores a hand knit gift, so I thought I should ask before I become carried away. Anyway, his response surprised me. Not to the question of whether the young lady would like a knitted something (yep), but to the idea that not all people want to receive handknits. He believes that anyone would appreciate such a gift, especially considering all of the time, effort, and skill involved. He further stated that the only ones who would not like to receive a hand knit gift would be people with too much money and the stupid. I guess I need to add my baby chicken to the holiday handknit list. I did not think he would much care for such a gift. Now to figure out what he would like. He is twenty-six. I am thinking mittens. While trying to choose a project for the Ravelympics, Helen considered knitting a sweater or the Shetland Triangle from Wrap Style. I urged her to knit the sweater, and said I would knit the Shetland Triangle with her afterwards. Interest amongst other Skanky Knitters has turned this into a full-fledged knitalong. I checked the book out from the library. Now that the date to cast on has been set, (9/15) I can hardly wait. I see other people knitting that shawl everywhere. I am ready to begin. There exists a bizarre rumor that I am a fast knitter. It is a myth, yet despite my protestations, it persists. This legend inspired Helen to suggest that I should knit two of these shawls. I am willing to give it a go. 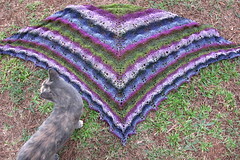 I plan to knit one shawl as written in the book, and one with more lace repeats. I have decided on the yarn for the smaller one, and have narrowed down my yarn choices to two for the larger. While these are not great photos, I present them to you and seek your opinions for the shawl. While waiting for the time to begin, I have spent a bit of time looking through Wrap Style. I am glad that it is available from the local library. I do not feel much for the other patterns in the book. I take that back. There are those which hold some appeal, but I cannot see wearing them, nor do I know someone for whom they would make a nice gift. On the other hand, I flipped through my copy of Folk Shawls the other night, and I saw many designs I would love to knit. As I looked at many of the pictures, my mind began to spin. I mentally matched patterns to stash and recipients. Then I recalled Margene's recent writings on monkey mind, and I relaxed.